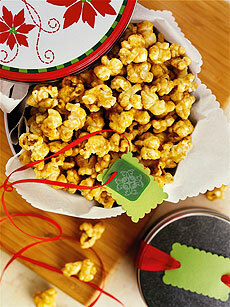 The flavors of the holidays are unmistakable in this addictive five-spice popcorn. Photo courtesy America’s Dairy Farmers. This is Page 8 of a 9-page recipe article. Click the black links below to view the other recipes. The flavors of the holidays are unmistakable in this addictive popcorn recipe, but you can adapt the flavors for year-round enjoyment by substituting sesame seeds for cloves and basil or rosemary for the allspice. Or, dig further into the spice cabinet and add what you like: anise, chile, cocoa powder, curry, poppyseeds: see it and shake it. Spiced caramel corn transforms the recipe from one-dimensional buttery sweetness to complex layers of flavor. The recipe yields 3 quarts caramel corn. *Should add up to approximately 1-1/2 teaspoons of powdered spices. Place popcorn in large bowl, set aside. Line rimmed cookie sheet with parchment paper. In medium saucepan, melt butter over medium heat. Stir in honey, brown sugar and salt. Bring mixture to boil, stirring constantly. Reduce heat to low and continue to simmer 5 minutes without stirring. Remove from heat, stir in baking soda and spices. Pour mixture over popcorn and quickly mix to coat. Spread coated popcorn onto prepared cookie sheet and bake 40 minutes, stirring every 10 to 15 minutes with spatula. Cool completely before packaging. Store caramel corn in airtight container at room temperature up to 5 days.